Our men's group will meet Wednesday morning (11/21/18) at 6:30am in BancFirst lobby located at 2500 S Cornwell, Yukon. Try to make it and consider inviting a guest. #GRAVY is just one of those things that makes the world go round! 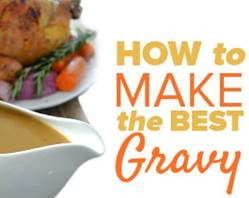 GRAVY is one of those things that always eluded me…or at least the making of it! Every Thanksgiving it was just there…I am pretty certain I knew who had made it – but I hadn't had the fortune of making it myself. Last week we were fortunate to have a "Friendsgiving" with several of our friends..
Guys, this was a crisis! Long story short – I went to a source and obtained the "miraculous" recipe for gravy. Turns out the recipe was pretty simple…just took lots of stirring! We overthink the situation, we underestimate ourselves and have no confidence in our ability. When the reality is just the opposite: the solution is simple, we are equipped and we just need to take action. This has been the case for me in many situations. I hope to see you tomorrow – but if not – I pray the Lord provides a level of appreciation for Him you have not experienced and your family time is spent counting our many blessings.